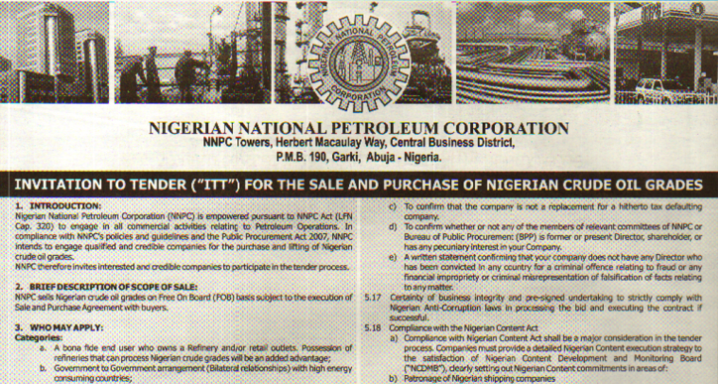 It’s that time of year again: the Nigerian National Petroleum Corporation (NNPC) is seeking new buyers for the country’s oil. In a tender announcement last week, the state-owned company invited “qualified and credible companies” to vie for contracts to purchase Nigerian crude in 2017; applications are due 24 November. Even with the current low oil prices, crude oil sales are the Nigerian government’s largest revenue stream. Typically, when not facing major disruptions, the corporation sells up to a million barrels daily; NNPC disclosed at least USD 14 billion in public oil sale revenues for 2015. Since 2014, when former central bank governor Lamido Sanusi raised an alarm that USD 20 billion in NNPC oil sale revenues had gone “missing,” oil sales have also been controversial and closely watched. The August 2015 report Inside NNPC Oil Sales—the first in-depth, independent analysis of how Nigeria’s oil is sold—took the Sanusi story further, showing how the corporation’s approach often suffered from high corruption risks and failed to maximize returns for the country. President Muhammadu Buhari was elected in March 2015, and promised to tackle corruption—including in the oil sector. NNPC’s first round of oil sale contract awards under Buhari—finalized last December—showed some improvements over what happened during the tenure of his predecessor, Goodluck Jonathan. The winner’s list included more refiners, curtailing Nigeria’s long-standing reliance on oil traders. It also had fewer of the unqualified, passive “middleman” companies that sometimes share the margins they capture with politically exposed persons. It also avoided Nigeria’s historically scandal-prone sales to smaller African governments. New management took some steps to make the award process more transparent, including opening bids on live television. The results were not totally without blemish. Several of the companies had serious legal and reputational red flags, not least alleged bribery and fuel subsidy fraud. Some were local fuel sellers not known for trading Nigerian crude abroad. NNPC had canceled other sales contracts with two other winners just four months before, saying they were “skewed in favor of the companies.” Inside NNPC Oil Sales estimated that three unbalanced terms in one of the deals cost Nigeria at least USD 381 million (or USD 16 per barrel) in a single year. And despite the early emphasis on openness and due process, NNPC's final published list of 2016 oil buyers—only released earlier this month—showed six more firms that were added later, for reasons unknown. It would unfair to expect NNPC under President Buhari to solve all of its oil sale governance problems in a single award cycle. Some go back decades, to times of military rule. Meanwhile Nigeria’s local content law puts pressure on the corporation to sell to Nigerian firms, even if these companies have weaker oil trading credentials. Hopefully NNPC will publish the full list of winners in a timely fashion. It should also consider disclosing the beneficial owners of the winning companies, to avoid rumors of political favoritism, as well as regular per-cargo sales data showing what the winning companies actually buy. Right now this information only appears years later in Nigerian Extractive Industries Transparency Initiative reports. Inside NNPC Oil Sales noted that the governments of Presidents Olusegun Obasanjo and Umaru Yar’adua also tightened up NNPC’s roster of oil buyers during their first years in office. But then questionable deals mushroomed as patronage demands grew—especially closer to election seasons. These next awards will signal whether the gains seen so far show a fundamental shift in the management of Nigerian oil sales or a more typical inaugural housecleaning exercise. Aaron Sayne is a senior governance officer with the Natural Resource Governance Institute.